It is extremely hot here in the UK at the moment! Heat can be difficult for us adults — it sure is for me — but it’s even harder for babies and young kids. They are not great at regulating their temperature and don’t really understand why it’s so hot and clammy all of a sudden. You can make it easier for them by dressing them correctly for the hot weather. Over the past few days, my two daughters have been wearing as little as possible to stay comfortable. My youngest is 13 months old and just has a nappy on most of the time and my eldest is 3 and a half years old and mainly lives in thin cotton dresses. Dress your kids as lightly as possible and let them wear nothing at all except underwear or a nappy at home if it’s extremely hot. 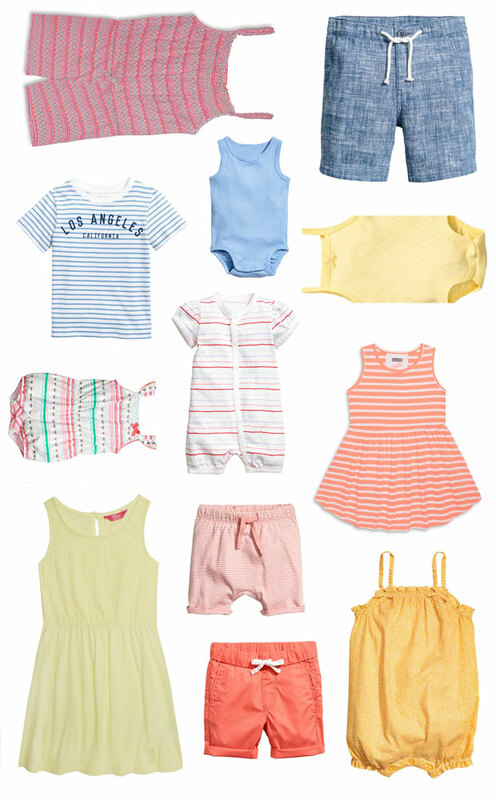 Great choices for lightweight clothes include sleeveless cotton dresses or rompers, linen or cotton shorts, short-sleeved vests for babies, tank tops and t-shirts made from thin materials that breathe well. Go up a size or two to ensure the clothes are not tight-fitting at all as that will make your kids feel sweaty and uncomfortable quickly. Choose light colours and loose-fitting designs. Bedtime is something that’s really difficult in the heat. Kids often take ages to fall asleep when it’s as hot as it is now. Our bedrooms reach nearly 30 degrees at night even with windows open and this is much higher than the recommended bedroom temperature for babies and kids. If you have a fan, definitely use it! We don’t have a fan but just let the kids sleep in a nappy or pull-up and nothing else. It’s too hot for sleeping bags and duvets. When it cools down later at night, you can put an empty duvet cover on your child if he or she is getting a bit cold. We all sleep without a cover at the moment though and that’s very rare for me! Ensure your kids have cold, fresh water available at all times and that they drink enough of it. If they don’t like water much or don’t drink enough, offer diluted juice, milk, smoothies or fruit pouches as well to up their fluid intake. Watery fruits like melon are great too. Ice lollies are a great way to cool down — you can make your own to keep them healthy. Avoid the midday sun completely with little ones. We pretty much stay inside until after 6pm in this heat though! If your kids have long hair, tie it up as otherwise it can make them too hot and cause heat rash on the neck and back. Cool baths and cold flannels are great ways to make your little ones feel more comfortable. Keep your house as cool as possible. Create drafts by opening windows, close curtains if the sun is beaming in and use fans if you have them. My kids are in nappies and knickers only whilst at home in this heat! Lightweight floaty clothes when out :) I do love the heat, but it’s not always so fun with little ones!